Despite numerous design updates and enhancements to conversations, the most profound change to iMessage isn't the app itself – it's other apps developers will build for it. 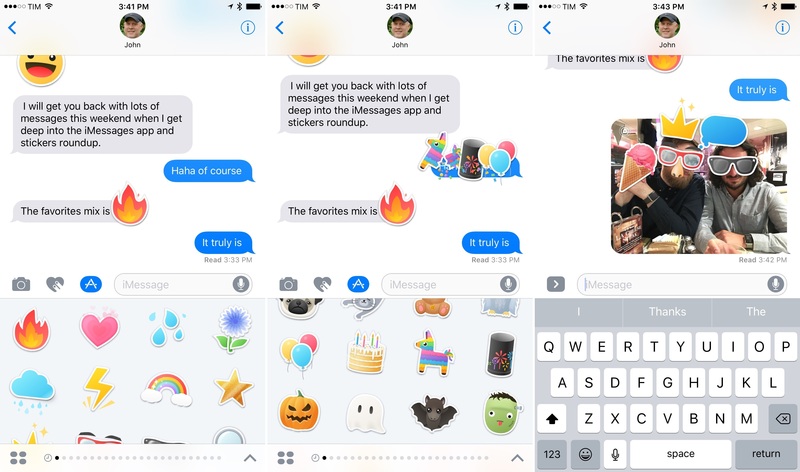 Apple is opening iMessage to developers in iOS 10, turning it into a platform that can be extended. The company has created a Messages framework for developers to plug into and build apps, which will be available on the new iMessage App Store. The stakes are high. For millions of users, their messaging app is a second Home screen – a highly personal, heavily curated gateway to contacts, private conversations, and shared memories. Messaging isn't just texting anymore; it's the touchstone of today's mobile lifestyle, a condensation of everything smartphones have become. Apple won't pass up this opportunity. Not this time. 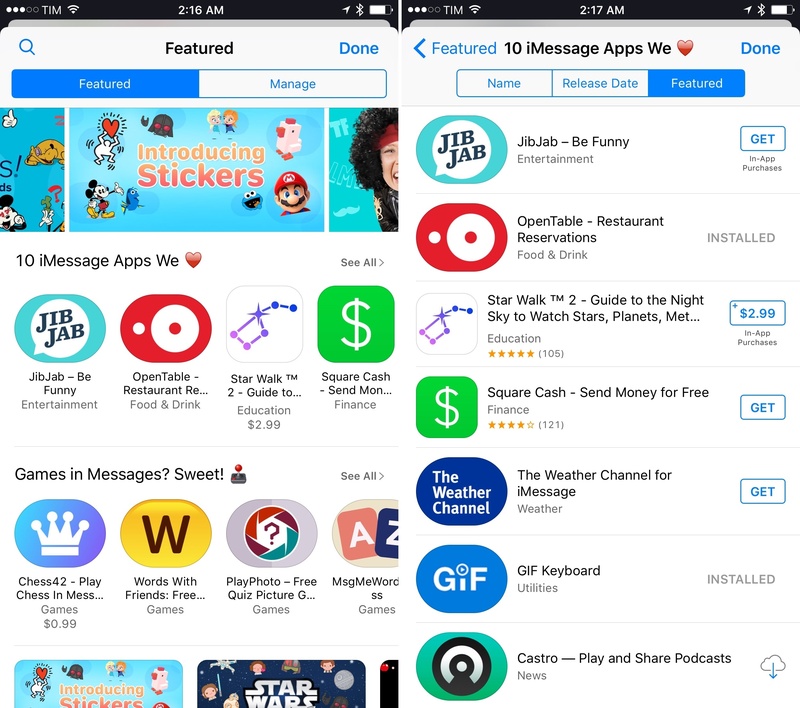 In opening up their most used app, Apple hopes that developers will take iMessage further with new ways to share and enrich our conversations. 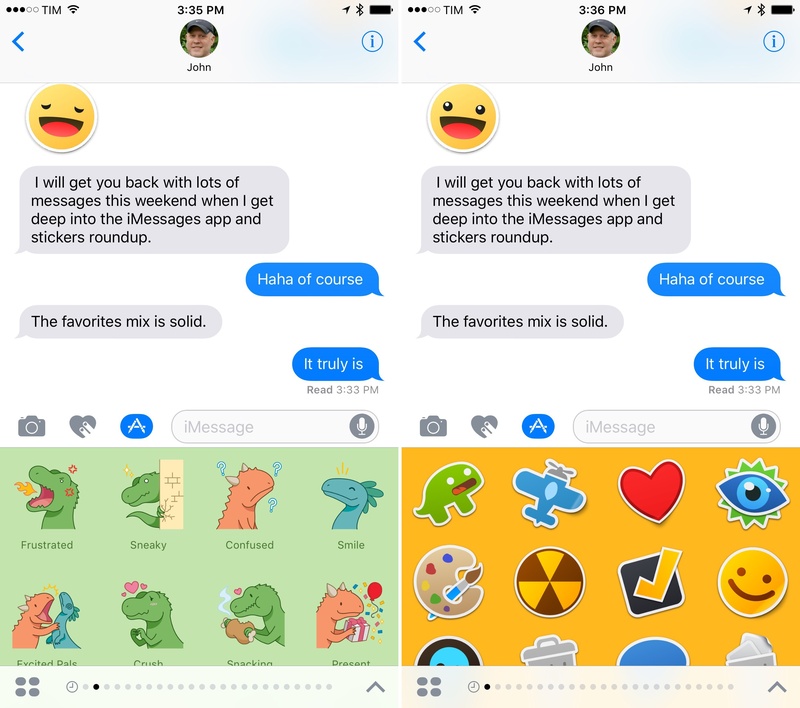 Developers can write two types of Messages extensions in iOS 10: sticker packs and iMessage apps. Both can be discovered and installed from the iMessage App Store embedded into the Messages app, and both can be created as standalone apps or as extensions within a containing iOS app. You can access the iMessage App Store with the apps button next to the input field. Messages will hide the keyboard and bring up a scrollable gallery of all your installed Messages extensions, opening the last used one by default. Apps are organized in pages and you can swipe between them. You can expand the currently selected app with the chevron in the lower right, and browse recent content from all apps via the leftmost page. Opening the last used iMessage app (left) and the Recents page (right). There's also a way to view a Home screen of iMessage apps as icons. If you tap on the icon in the bottom left corner, you'll be presented with a grid of oval icons (the shape for iMessage apps) and a '+' button to open the iMessage App Store. The iMessage app drawer (left) and the new iMessage App Store. In addition to the Home screen-like app drawer, iMessage apps can be deleted from the Manage view of the iMessage App Store. Like on the Apple Watch, you can choose to automatically add iMessage apps on your device to your app drawer (if you install an iOS app that contains an iMessage extension). I wish the normal App Store supported deleting apps through toggles like the iMessage App Store does. 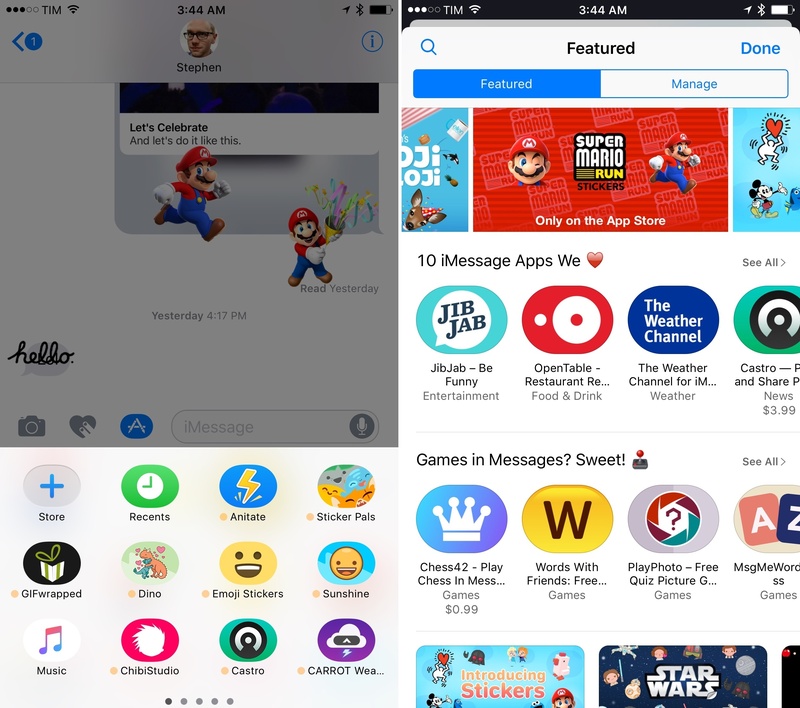 As for content on the iMessage App Store, it's been modeled after the watchOS App Store with a front page collecting featured apps, categories, games, and other curated picks by Apple. At launch, Apple is heavily promoting sticker packs from brands such as Disney and Nintendo, but there's a good variety of apps and stickers from smaller developers as well. One nice detail: on the iMessage App Store, Apple is using emoji in section names, which isn't the case for other App Stores. 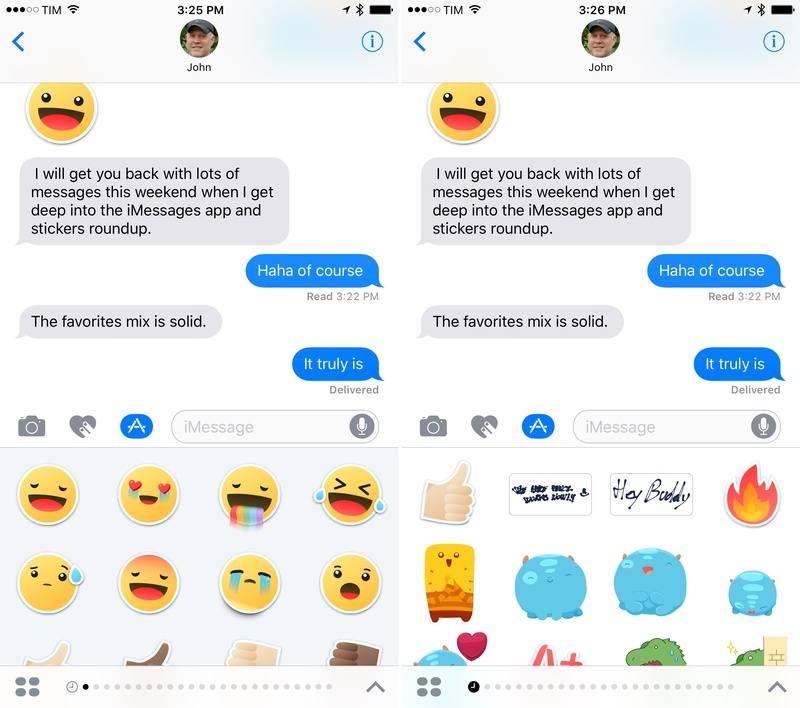 I'm more optimistic about the iMessage App Store as it's embedded in Messages, which should encourage more users to check it out. Perhaps a Messenger-like design with top launchers embedded above the keyboard would have been a preferable solution. 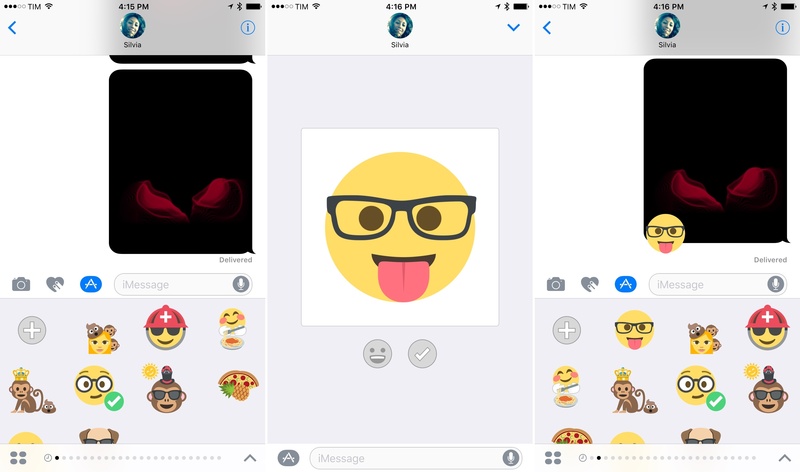 iMessage stickers can be seen as Apple's response to the rise of third-party "emoji" keyboards that offer selections of sticker-like images, usually in collaboration with brands and celebrities. 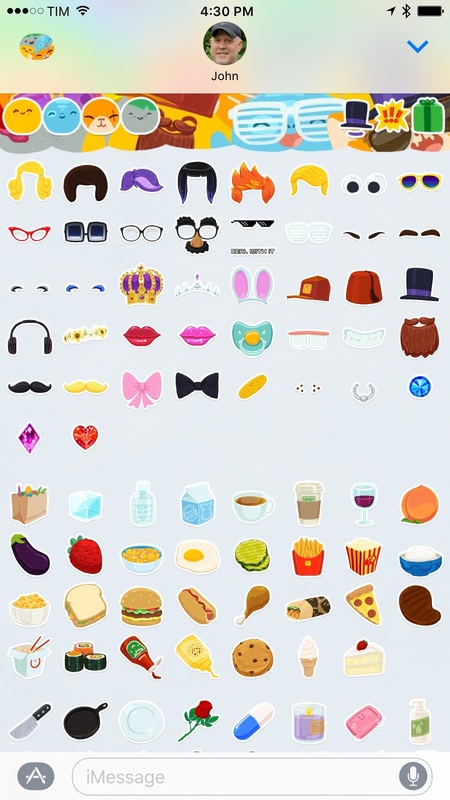 If you've seen the likes of KIMOJI, Justmoji, PetMOJI, Bitmoji, and literally anything -moji on the App Store lately, you know that's an aspect of iOS Apple could improve for both users and developers. 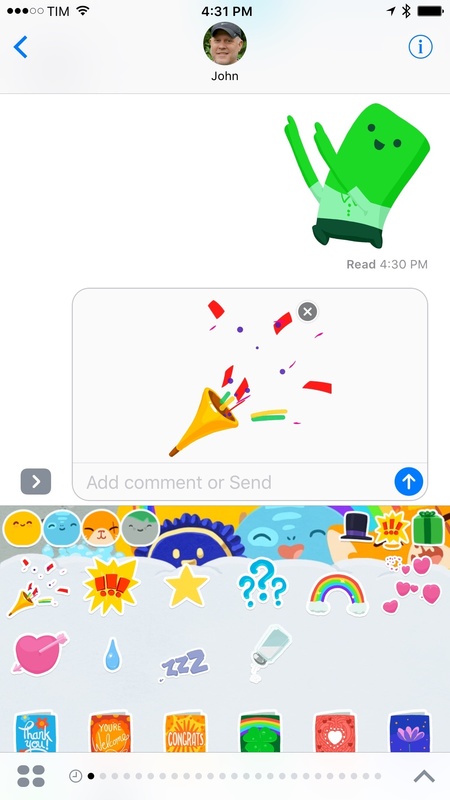 However, I don't blame developers for trying and riding on the coattails of emoji.26 I'd argue that a lot of companies settled on the "moji" suffix because iMessage was the only big messaging service without native sticker support, and emoji were already in the typical iOS user's vocabulary. Stickers provide an enormous opportunity for developers and, yes, brands to give users fun ways to express their feelings with a wider array of emotions and contexts than emoji alone. Look at LINE, and the massive, multi-million dollar success of Cony and Brown and revenue from their Creators Market; think about Twitter and how they commissioned a set of stickers to be used on photos. 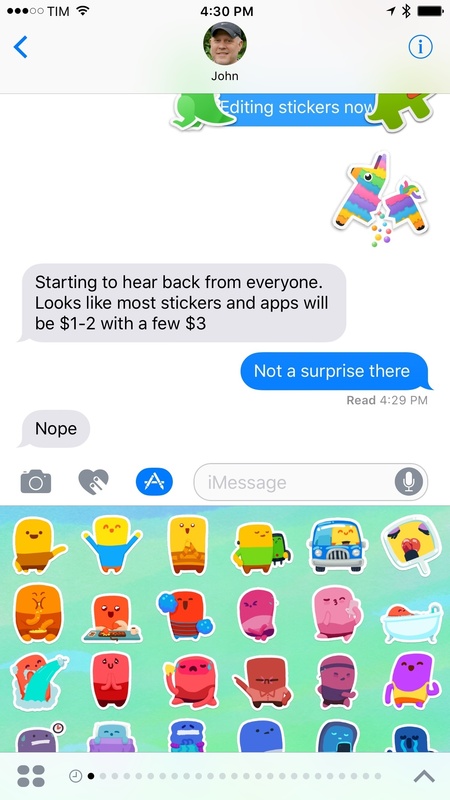 If every major messaging platform has found stickers to be popular and profitable, there must be something to them that appeals to people. 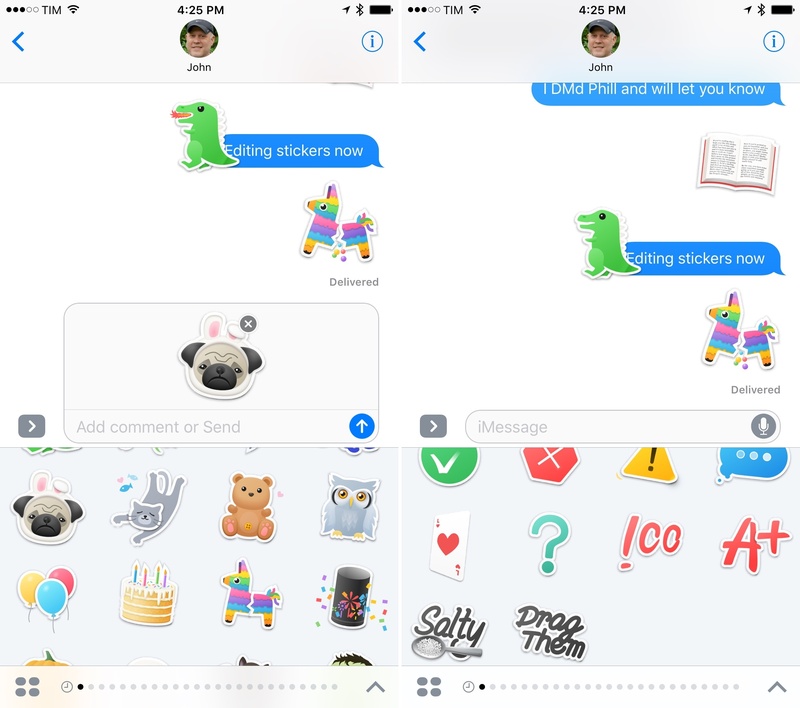 With iOS 10, Apple, too, wants a piece of the action and is letting developers create sticker packs for iMessage. The goal is to entice users to personalize their iMessage conversations with stickers, download additional packs, and spread usage with friends. The company plans to do so with a superior experience than custom keyboards, with the prospect of a new gold rush for developers. Stickers live in the standard sticker browser – the compact view that opens after choosing a sticker pack from the app drawer. This area can have a custom background color and it's where you can interact with stickers. You can tap on a sticker to place it in the input field and send it individually, or you can peel it off the browser and drag it around in a conversation. Tapping a sticker to send it (left) and peeling it off (right). The animation for peeling stickers off the browser and re-attaching them is some of Apple's finest OpenGL work in a while. You can attach stickers to any message bubble in the transcript: you can put one next to a text message, cover a photo with multiple stickers, or even put a sticker atop another one or a GIF. Want to peel off a sticker and use it on an older message? Drag it over the title bar, wait for the conversation to scroll back, and attach it wherever you want. How about covering your friend's eyes with googly eye stickers? You can do that too. Things can get out of hand quickly. Stickers can also be rotated and enlarged using pinch gestures. 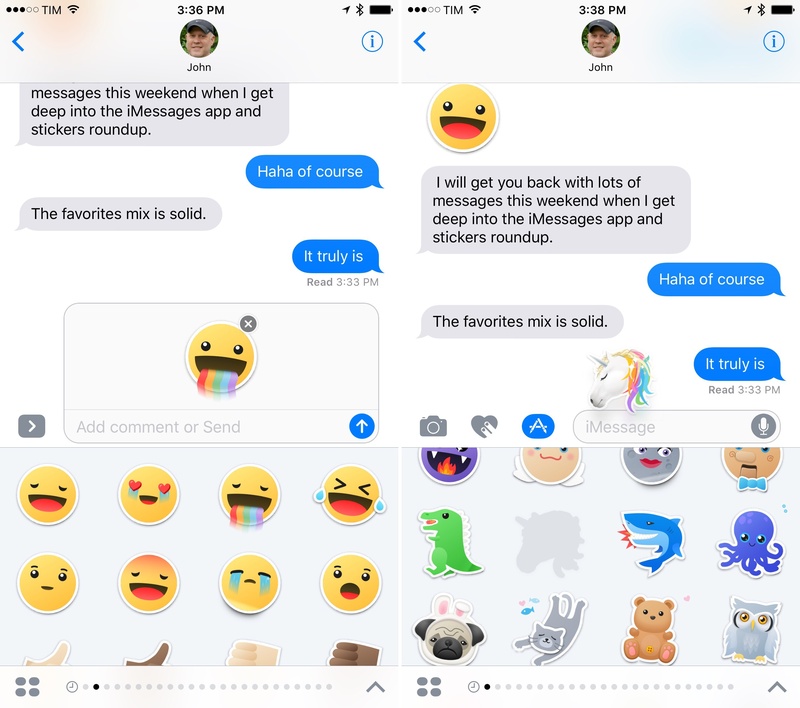 From a user's perspective, stickers make iMessage conversations feel different. More lively and fun, but also busier and messier if overused. I've been able to test about 30 different iMessage sticker packs from third-party developers in the past couple of months. One of the highlights is The Iconfactory, which leveraged their expertise in icons and illustrations to create some fantastic sticker packs for iMessage. From Sunshine Smilies (emoji characters as stickers) and Tabletop RPG (role-playing emoji stickers) to Mystic 9 Ball and Dino, I believe The Iconfactory has found a perfect way to reinvent themselves for the iMessage era. They're a great fit for stickers. 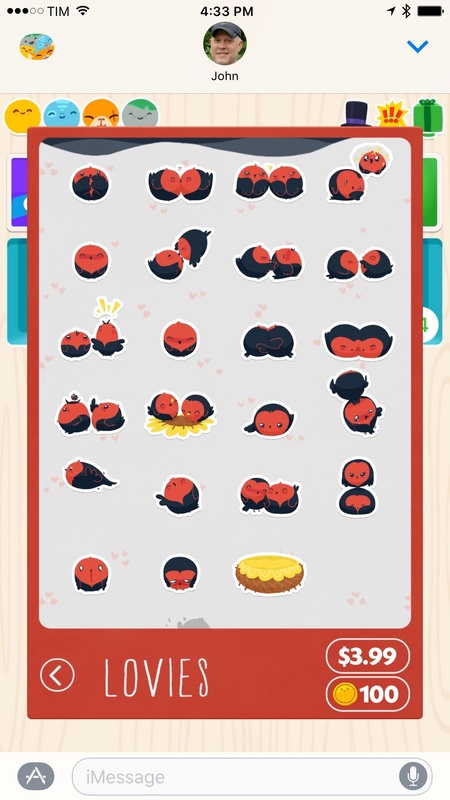 Developer Raul Riera has created what I believe is going to be a popular type of custom sticker app: Emoji Stickers lets you put together your own stickers containing emoji characters. You can create concoctions like a monkey wearing a crown or a pineapple pizza. This is done with a custom sticker-assembling UI and built-in emoji from the open source Emoji One set. 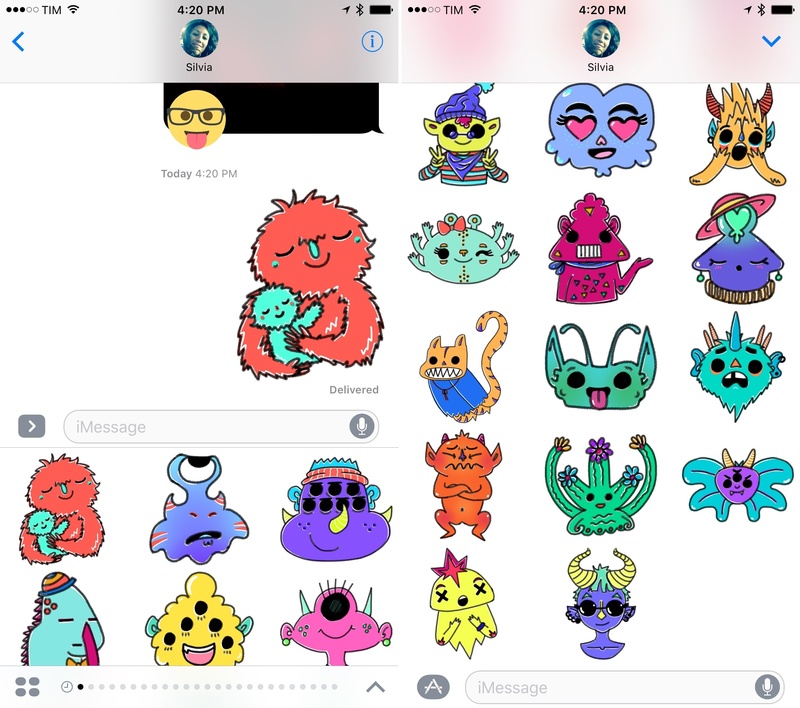 Monstermoji, created by Benjamin Mayo and James Byrd, features beautifully hand-drawn monster characters you can attach to messages. These stickers are unique, and they show how anyone can easily create a sticker pack and release it. I also like Anitate, a set of 80+ animated stickers by Raven Yu. Look at that sad pug with bunny ears. Anitate's stickers are like animated emoji, redrawn for a flat style with animations. They're fun and I've been using them a lot. Last, I want to mention Sticker Pals – by far, the most impressive and beautiful sticker pack I've tried. Designed by David Lanham in collaboration with Impending, Sticker Pals features a large collection of animated hand-drawn stickers for various emoji-like objects, symbols, and animals. The illustrations are gorgeous, animations are fun, and there are hundreds of stickers to choose from. 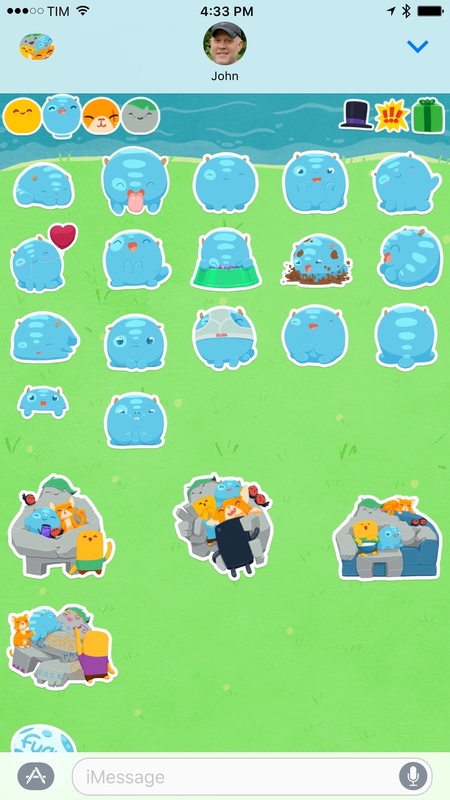 Unlocking stickers in Sticker Pals' in-app store. Sticker Pals is a good example of what can be achieved by creating a custom sticker browser with the Messages framework. There are buttons at the top of the browser to switch categories, and each tap corresponds to a different sound effect. 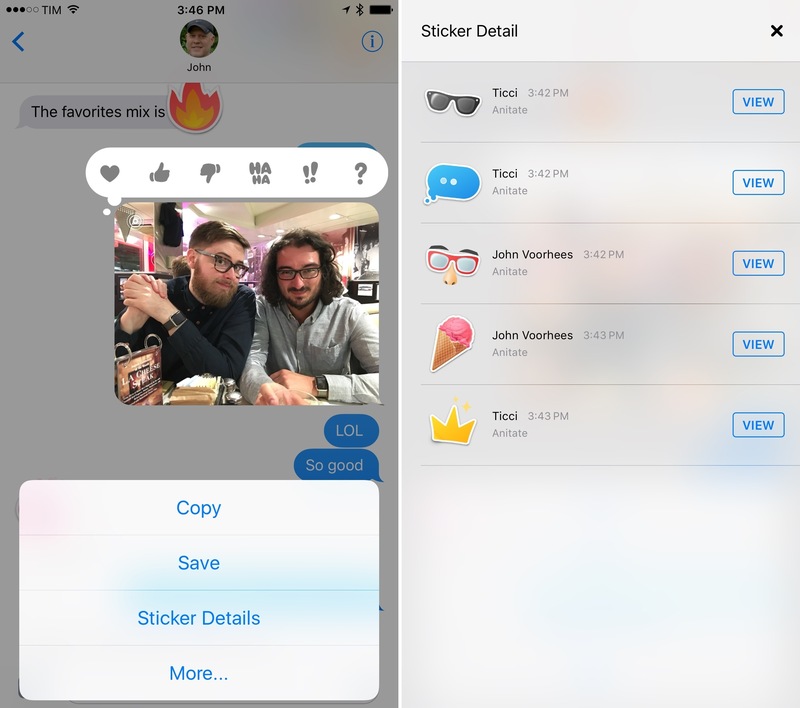 Plus, the developers have devised a clever unlocking mechanism for extra stickers with an in-app store and the ability to send stickers as gifts to your friends – all within an iMessage app with a sticker browser. 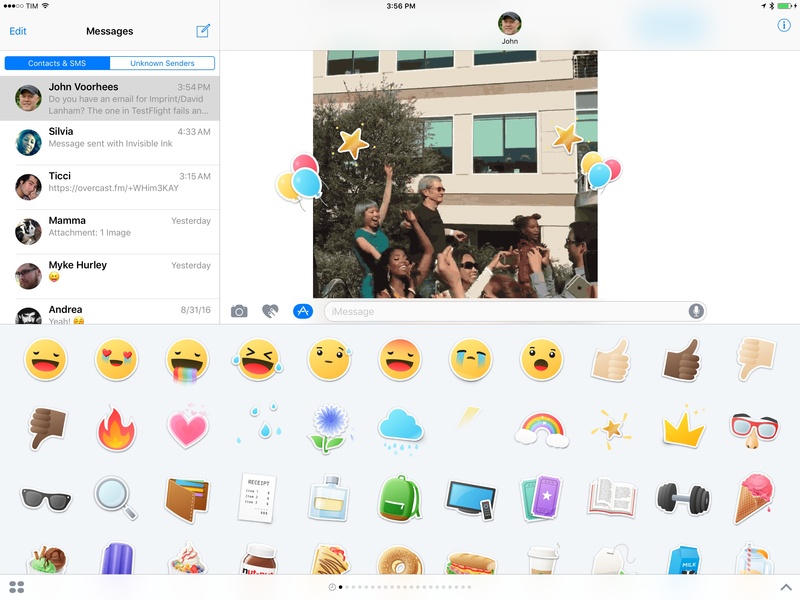 With iMessage stickers, Apple hasn't just created a better way to paste images in conversations. They're stickers in the literal sense – they can be attached anywhere, sometimes with questionable results, but always with a surprising amount of freedom and experimentation. Mixing multiple stickers at once on top of messages could become a new activity of its own32 – I know I've had fun placing them over photos of my friends. Stickers are often looked down upon by the tech community because they seem frivolous and juvenile. But emoji were met with the same reaction years ago, and they've gone on to reinvent modern communication, trickling into pop culture. Stickers are messaging's lingua franca. iMessage stickers probably won't have the same global impact of emoji, primarily because they only work in iMessage33 and the service isn't cross-platform. But I also believe that stickers are the perfect addition to iMessage in 2016. Stickers are messaging's lingua franca. Their adoption is going to be massive – bigger than custom keyboards have ever been. Stickers are lighthearted, fun to use, and they make each conversation unique. Let's check back in a year and see how many sticker packs we have installed.